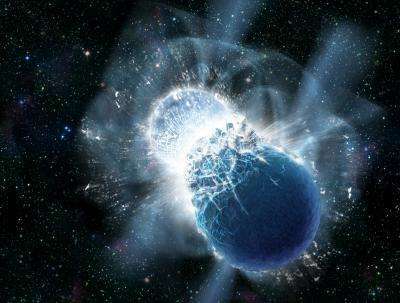 This artist's conception portrays two neutron stars at the moment of collision. New observations confirm that colliding neutron stars produce short gamma-ray bursts. Such collisions produce rare heavy elements, including gold. All Earth's gold likely came from colliding neutron stars. Credit: Dana Berry, SkyWorks Digital, Inc.
"Unlike elements like carbon or iron, [gold] cannot be created within a star"
I thought gold and elements above iron were created as the result of a star going supernova compressing and fusing lighter atoms into heavier ones and ejecting them into space. What happens to neutron star material when removed from its gravitational environment? Once created, is it a perpetual end state, or can it expand into normal matter again? Why would neutron star material create normal matter again even after a collision? Wouldn't any neutrons ejected from a collision just remain as neutrons? Where would the protons and electrons come from to create this gold? Whether the gold on earth came from two colliding stars or one that exploded is not answered by this article. The collision of two neutron stars is very unlikely and not even needed to produce all the heavy elements above iron. Supernovae are quite capable of doing that. It is much more likely that the gold on earth came from our own sun in its previous supernova stage. Sorry, I had a double post and deleted the second one. It is much more likely that the gold on earth came from our own sun in its previous supernova stage. In its what? I'm sure I must be misreading this. Surely you aren't asserting that our Sun has gone through a supernova... right? Well yes I am, in fact it explains a lot of hard to explain questions about our solar system. For instance why was the sun cooler 3 or 4 billion years ago than it is today. Well, the Sun is a main sequence star, and they tend to get progressively larger and hotter as they age. Since our Sun is about halfway through the main sequence, that implies that it was quite a bit smaller and cooler in the past. This seems to be a variant of nucleosynthesis by x-ray transformation. @Pressure2: A star that has gone supernova won't return to the main sequence as our star is in, nor will its pristine planets have the same age. So no. The young faint sun (not exactly as much cooler as fainter, thus heating Earth less) is a phase that all main sequence stars undergo, and is not in need of any less likely prediction. A process that stars in open clusters regularly are made by, from molecular clouds of course. It is not very likely a star like our sun would get larger and hotter as it ages once fusion starts. Our sun is most likely getting smaller and cooler because solar flares expels lots of matter over billions of years. As for our sun being a main sequence star, well that is very compatible with it being a supernova previously. What do you think happens to neutrons stars? Their neutrons most likely decay layer by layer until enough hydrogen gas collect for the fusion process starts again. May I suggest you take an introduction to Astronomy course on on any of the MOOC sites. No offense, but everything you just said is *highly* incorrect. I suggest you read some introductory Astronomy books. Axe, what do you think happens to old neutron stars? Do you really think our sun is getting larger when it expels massive amounts of matter every day? Do you really think we have the final answers about the origin of our solar system or even our universe? I do not think so, not even close. Do you really think we have the final answers about the origin of our solar system or even our universe? I do not think so, not even close. And yet, you are talking like you do. I don't think you're an idiot, but I do think you may simply be mistaken. Where are you getting this from? You are very mistaken in nearly everything you say. As a sun uses up matter it gets larger because of decreased gravitational attraction. Ever heard of a red giant? Our sun will become one. The Sun does not have enough mass to explode as a supernova. Instead it will enter a red giant phase. The Sun is predicted to become a red giant in approximately 5.4 billion years. So, it gets bigger and cooler. the afterglow being consistent with decay of heavy elements is interesting. That definitely points to the creation of some quantity of gold. The above story is based on the assumptions of a lot of uknown variables though. For example, the proportion of various elements created by such an event cannot be guessed with out current knowledge of these processes. They could be off by quite a large margin of error, and I'm sure they know that. The way the press release was worded was most likely just meant to be fun or playful. I like that kind of creative imagination in science, but laypeople often take the light hearted banter too seriously. Some of you here need to take a chill pill and understand that the assertion of all of Earth's gold being created in this manner was just an off the cuff remark. As for our sun. It is certainly not a first generation star. It is composed of the remains of many previous stars along with some amount of primordial matter. It is a frankenstar, like most. isn't the statement that ALL gold in the cosmos is formed during star collisions a bit grand? It is known already that gold on earth can form during earthquakes, so that definitely doesn't come from colliding neutron stars. No, that is NOT known. Gold is not created during earthquakes. Elements cannot be created either chemically or through any geologic process. Gold may be *concentrated* during a seismic event, which is what you and I have read recently, but the gold atoms are already present in the Earth's crust, they most certainly aren't created by the ground shaking. It's a fundamental error to confuse the two. As far as Pressure2's gross misconceptions go, they are astounding. Supernovae mark the *death* of a star--they are not part of the main sequence in any way whatsoever. The Sun isn't large enough to go supernova, and the suggestion that it once was, and somehow survived (without destroying the planets) to carry on is as ludicrous as believing in zombies. Saying you just can't believe it is simply an argumentum ad ignorantiam. This is Astronomy 101. Earthquakes may uncover gold, but not create the atoms. All atoms except Hydogen and Helium ONLY come from exploding stars. You are literally made of stardust. All elements heaver than Iron require an exploding star to form (the star collapses soon after it starts making Iron) or colliding neutron stars as the article explains. I thought gold could form in neutron rich supernovas, but the article seems to be saying it requires two neutron stars. thanks guys, I had to re-read on this, indeed the earthquakes bind the gold atoms, not create them. All atoms except Hydogen and Helium ONLY come from exploding stars. Anything heavier than iron and nickel need more energy than stellar fusion can provide in order to be formed. The sun gets larger because of decreased gravitational attraction, nonsense. It get less massive for two reason, it expels huge amount of matter on a daily basis and it coverts MASS into energy which it radiates away. In theory the sun will get much larger in its latter years because it expands, it becomes less dense. But it does NOT become more massive. Sure the sun is not massive enough today to go supernova because it expelled most of it mass in its supernova stage. Just to make a slight correction, I said that the Sun is becoming larger and hotter. I should have said it's getting larger and the luminosity is increasing (which makes it seem hotter). The actual surface temperature is very nearly constant. Pressure2... please, put your need to defend yourself aside and just read some introductory astronomy material. You're spewing nonsense. Your statements aren't even internally consistent. Axe, more than defending myself I am pointing out the holes and wishful thinking on the part of people like you. No one ever answered my question as to what happens to neutron stars. Here is another question maybe you can answer for me, what happens to the energy and momentum in a photon as it is shifted to a lower frequency because of the accelerating expansion of the universe? It seems to me the BB theory has gone full circle after resorting to the magic of the inflationary period and the accelerating expansion of the universe to end up the same problem the Steady State universe had. Either tired light or the photon theory of light has a major problem. It is not very likely a star like our sun would get larger and hotter as it ages once fusion starts. We can tell that the energy received by Earth has been increasing from the fossil record. That matches both the theory and what is observed in countless other main sequence stars. As for our sun being a main sequence star, well that is very compatible with it being a supernova previously. What do you think happens to neutrons stars? They cool and stay as neutron stars for ever (unless hit by something). Ones that can gain more matter in a binary system will implode into a black hole. Their neutrons most likely decay layer by layer until enough hydrogen gas collect for the fusion process starts again. That's not possible, the neutrons formed because the electrons were crushed into the nucleus and there is no way to reduce the pressure without vast amounts of energy to lift material from the surface. Here is another question maybe you can answer for me, what happens to the energy and momentum in a photon as it is shifted to a lower frequency because of the accelerating expansion of the universe? The answer to this problem is actually pretty interesting. Basically, as the photon travels through an expanding spacetime, the wavelength increases, which reduces the apparent energy. The apparent energy is the energy seen by the target the photon hits. This reduction in the apparent energy makes the source appear to be redshifted. However, the source sees something rather different happen. From the source's perspective, the energy of the photon is unchanged. Why? Because as the wave stretches, the fields occupy an ever-increasing volume. Integrating the relevant fields over all space would reveal that the energy is constant with time. So basically the apparent loss of energy comes from the fact that the source and the target are not in comoving reference frames. TL;DR: Energy conservation only applies to events taking place in a single comoving inertial reference frame. Energy conservation can fail when applied to interactions between reference frames that have relative motion. Wishful thinking. We have no evidence that gravity or pressure has any effect on decay rates. If it did we should have certainly noticed that on the moon, mars and the Voyager. The one-half life of a neutron is about 15 minutes. So it should not take long for a neutron star to decay layer by layer from the outside forming hydrogen gas. By the way where are all the neutron stars created over the last 13 billion years? Axe, so now you are willing to add a third layer of magic in order to say the BB theory. I think the SS theory only needs one, maybe you should reconsider. I'm seeing some truly insane ideas here. How the hell would gold be produced in an earthquake? An earthquake isn't nearly strong enough to overcome the positive charge of the protons in two atoms to cause them to merge into a new atom. Neutron stars are composed of matter supported by degeneracy pressure. Therefore, the neutron->proton decay requires a very large input of energy, meaning that the neutrons in the star are stable. Also, physics is not magic. Wishful thinking. We have no evidence that gravity or pressure has any effect on decay rates. Inverse beta decay is observed in the lab and the conditions required for it are known. If it did we should have certainly noticed that on the moon, mars and the Voyager. The pressure in neutron stars is many orders of magnitude higher than any planet. The one-half life of a neutron is about 15 minutes. So it should not take long for a neutron star to decay layer by layer from the outside forming hydrogen gas. If the pressure were reduced by some magical means, the neutrons would decay releasing electrons but the protons and remaining neutrons would start by forming the densest nuclei (trans-uranics) and they would decay to the lowest energy stable nuclei, mostly lead and titanium with long half life heavier elements and a helium atmosphere. By the way where are all the neutron stars created over the last 13 billion years? Still around, pulsars for example. Thanks for pointing that out Natello. There was another article in physorg several years ago that claimed decay rates varied by the time of the year, being slight faster when the earth was closest to the sun. While none of this has been proven I happen to believe it is very likely because radioactive decay can be caused by gamma rays but most is caused by the background of neutrinos. But of course that is not what Fleet was claiming, he is claiming that in extremely strong gravitation fields and pressure neutron decay would cease. I do not think it has anything to do with gravity but rather the nature background of neutrino radiation. That is where nearly all the energy need to cause radioactive decay comes from. Neutrinos cause most radioactive decay, yes there is NO magic in radioactive decay either. But of course that is not what Fleet was claiming, he is claiming that in extremely strong gravitation fields and pressure neutron decay would cease. I do not think it has anything to do with gravity but rather the nature background of neutrino radiation. The 15 minute figure you quoted is for free neutrons decaying without any external influence. Now consider that the atoms in your body all contain neutronbut they don't decay because of the interactions in the nucleus. The pressure in a neutron star means the neutrons are as closely packed as those in the stable atoms in your body. Even if the neutrons do sometimes decay, the reverse process is dominant at that pressure. Your real problem though is that iron has the highest binding energy and it takes an input of energy to create any element less massive. Supernovae convert most of the star to heavy elements (which releases the energy that powers the explosion) and there is no way back from that fusion process. Fleet, a supernova's remnant is a neutron stars, it contains little if any heavy elements. Now what it expels very likely contain many if not all the heavy elements. As to why free neutrons decay but never decay in the stable elements like in our bodies, well a free neutron is just that an individual which when it collects enough energy from the background of neutrino radiation the electron is ejected creating hydrogen gas. This does not happen in stable elements because this extra energy a neutron may absorb from background of neutrino radiation is passed onto the other protons and neutrons in the nucleus and then to the rest of the atom which intern passes this excess energy to other adjacent atoms. These neutrons never collect enough energy to decay, stability reigns. Fleet, a supernova's remnant is a neutron stars, it contains little if any heavy elements. Now what it expels very likely contain many if not all the heavy elements. That might leak out but first you need a way to remove material from the surface of the star to reduce the pressure. That doesn't happen, it would show up as a discrepancy in the energy measurements. Okay, I left out the antineutrino that the decay of a neutron also gives off. The mass will add up when one considers the mass of the proton, electron and the mass converted to energy carried away by the antineutrino and the mass converted to kinetic energy in the proton and electron. If I am not mistaken the amount of kinetic energy carried away by electron and proton can very. Now why would this be? I think one possibility is the amount of energy that the neutron absorb from the background neutrino radiation that caused it to decay also varies. The amount of energy carried away by the antineutrino probably also varies. That I'm not sure of though. There is no discrepancy in the energy measurements when all the remaining mass and mass converted to energy are totaled plus the energy of the neutrino striking the neutron. GSwift, you must be confusing what I said with what Fleet said, he did make the statement that a neutron star is a mixture of neutrons and heavy elements. I said a neutron star is made entirely of neutron or very nearly so. I did say that a supernova expels a mixture heavy elements. You are also confused about what I said about hydrogen, I never stated there was such a thing hydrogen neutron or helium neutrons. All I said was that when a neutron decays it decays into a hydrogen atom, that it does. What I'm talking about is the boundary between the inner and outer crust where there is dynamic equilibrium. If some crust were removed, the boundary would move inwards producing new crust. Pressure2 might want to check out some of these more recent papers, as they represent a more nuanced (but again, a *very* technical) approach to the subject. Neutron star astrophysics is NOT high school level physics. I did check out these papers and they are all just speculation. All we really know about neutron stars are their mass and approximate size. We know nothing about what is below the surface. It is really irrelevant and has little to do with what happens to a neutron star in the future. I am simply stating they decay, I am sticking by that statement. My statement that neutrons decay is NOT speculation. I did check out these papers and they are all just speculation. No, the equations used are derived from lab experiments and backed by many thousands of actual experiments. The area the at poorly known is the equation of state of the inner regions which are mainly neutrons but even that is reasonably constrained. We know nothing about what is below the surface. It is really irrelevant and has little to do with what happens to a neutron star in the future. I am simply stating they decay, I am sticking by that statement. Fine, but your are wrong because as more material falls onto the surface, the boundary must move out as the outer crust depth will be roughly constant. My statement that neutrons decay is NOT speculation. Nobody is disputing that FREE neutrons decay, it is the fact that neutrons don't decay when in a nucleus that invalidates your argument. If not, in the next 15 minutes, half your mass will have become hydrogen. Fleet, how do answer the fact that neutron DO decay many times in the nucleus. You can NOT claim they don't decay in the nucleus, they do. I already answered that question in a previous posting. As for knowing what is going on below the surface of a neutron star, no we do not know and are not even able to conduct experiments to resolve that question at this time. Also can you tell me what is the difference between a neutron and a sea of protons and electron as claimed in one of the links you posted? Their density seems to be identical. This does not happen in stable elements because this extra energy a neutron may absorb from background of neutrino radiation is passed onto the other protons and neutrons in the nucleus .. It is rubbish because neutrons do not absorb energy in the way you suggest. There is no excess seen when they decay compared to the original neutron mass. As for knowing what is going on below the surface of a neutron star, no we do not know ..
You may not but science has a reasonably accurate picture as shown in the links I posted. There are areas where our knowledge is limited of course, that's the case in all fields, but it results in fairly small uncertainties as you could see from the bar charts. Since you do not know why some neutrons decay in some nuclei and not others you have absolutely know idea whether I wrong or not. Furthermore we DO know that when a neutron decays it radiates away a neutrino so what in the world would give you the idea it could NOT absorb this same neutrino? After all an electron and proton can radiate and absorb EMR, no one disputes that. You state that all the energy and mass are accounted for in decay products, well that is not quite accurate. That is how we figured out that there was this particle or neutral radiation that carried away the excess energy to make the figures add up. It is just assume the neutrino carries away what is needed to balance things but we do not know the EXACT amount it actually carries away. I am still waiting for the difference between a "sea of protons and electrons" and a neutron. And NO we do not have experiments to back up that claim here on earth that I ever heard about. Also can you tell me what is the difference between a neutron and a sea of protons and electron as claimed in one of the links you posted? Their density seems to be identical. A neutron and a proton are different groupings of quarks. If given enough space and not bound in a stable nucleus, a neutron can split into a proton and an electron. When sufficiently confined, the reverse process can happen. The equilibrium mix depends on the relative energies so as you go deeper into the star, the proportions change. Turning those elements back into anything below iron would need a huge input of energy. If our Sun had previously been a supernova, it would be a white dwarf or have a surface with the above mix. Quote Fleet: "Turning those elements back into anything below iron would need a huge input of energy. If our Sun had previously been a supernova, it would be a white dwarf or have a surface with the above mix." You correct as far as you go, it would take a huge amount of energy and the energy needed comes from the natural background of neutrino radiation. Nearly ALL of this incoming neutrino energy goes into creating hydrogen atoms from the neutrons it decays. After millions of years you end up with a main sequence star like our sun. It is highly doubtful that many neutrinos can penetrate a neutron star. The background of neutrino radiation contains a HUGE amount of energy. As for the mixture of elements you give, wrong, it would be mostly hydrogen. Geez come to think of it, I think it is. How can anyone be sure that all nuclear synthesis only takes place in stars? Only because their models say so. What would happen if, as is so often the case, the models are wrong? We can start punching holes in the models by offering exceptions. The more holes, the leakier the boat until eventually it sinks. Should we be enraged if our favourite model sinks? No. We should have been gleefully throwing stones at it ourselves, not trying to defend it. Here is my first stone. What about muon catalysed fusion. I read somewhere that it takes place at 1000 events per square meter per second in the ground upon which you stand. What is your best stone? It's good to get an agreed starting point. it would take a huge amount of energy and the energy needed comes from the natural background of neutrino radiation. There is no such background, it would be seen by the neutrino observatories. Relic neutrino from nucleogenesis have a temperature <2K. Nearly ALL of this incoming neutrino energy goes into creating hydrogen atoms from the neutrons it decays. The neutrons in the Earth aren't decaying, you're still here. After millions of years you end up with a main sequence star like our sun. The Sun will last 10 billion years. To revert that fast needs 10,000 times the power it gives off as input. It is highly doubtful that many neutrinos can penetrate a neutron star. They are so small, they are transparent to neutrinos despite their incredible density. Those results have been around for decades and reviewed by many people. If you think you can find an error in the calculations, go ahead and post it. Just saying "wrong" when you blatantly haven't a clue about the conditions or even basic conservation of energy, is no argument. it would be mostly hydrogen. There would be no hydrogen produced whatsoever. There would be some helium produced as alpha particles from the decay of unstable heavier elements which would add to the atmosphere of the neutrons star but that's all. Of course you are still avoiding the biggest problem of all, how do you propose to remove the crust of the star so that the inner core can change back to nuclei. Within the inner core, the conditions are such that protons combine with electrons faster than the reverse process so any protons produced by neutrino interactions (or any other method) revert to neutrons faster than they can be produced. If you want to put a hole in standard model for stellar fusion, you need to calculate the muon flux within the star. Muons have a half-life of 1.5us so how do you propose those muons are created in sufficient numbers to influence the overall metallicity? If you are so convinced there is not a background of neutrinos check out the estimate of how many pass through your body every second. From what I have read it is about a trillion. How much do think this amounts in energy? That is more than enough energy to decay the surface neutrons on a neutron star turning it into a main sequence hydrogen rich star in a few million years. Also once fusion process starts again more neutrinos would be created accelerating the decay of the remaining neutron core. As that happens the fusion process would increase also and heat up the sun even more. That is why the sun was cooler in it earlier days! Well if I read you post correctly you were giving the mixture for a white dwarf. Well again I say you are wrong, the sun is NOT a white dwarf, never was one and will not be one for about 5 billion years. So the mixture you give is meaningless to apply to the sun or a neutron star. If you are so convinced there is not a background of neutrinos check out the estimate of how many pass through your body every second. From what I have read it is about a trillion. Right, and they have come from the core of Sun without interacting with anything. The mass of a neutron star or white dwarf is comparable so the number of nucleons in the path is about the same too. That's why we know a neutron star is transparent to neutrinos. How much do think this amounts in energy? That is more than enough energy to decay the surface neutrons on a neutron star turning it into a main sequence hydrogen rich star in a few million years. It decays by emitting an anti-neutrino so could absorb a neutrino instead. The result would be nitrogen-14. Well if I read you post correctly you were giving the mixture for a white dwarf. Well again I say you are wrong, the sun is NOT a white dwarf, never was one and will not be one for about 5 billion years. I totally agree with that of course, prior to forming as a main sequence star, it was cold, diffuse hydrogen/helium gas in a nebula. Just FYI, white dwarfs are a mix of carbon and oxygen although some more massive dwarfs may be able to fuse the carbon producing an oxygen, neon and magnesium mix. Let say the diagram of a neutron star is totally correct, it makes no difference because we both agree neutrons in nuclei can and do decay creating a hydrogen atom. As for your statement that a neutron star is transparent to neutrinos, we know nothing of the kind. You cannot make direct comparison of the sun and a neutron star because the sun is plasma mostly empty space where as a neutron star is more dense than a nucleus. And remember NOT all neutrinos from the sun are transmitted even through the earth. A neutron star is billions of time more dense and should stop billions of the number. That is enough to cause the decay of billions of nuclei neutrons. Billions of time in a fraction of a second times millions of years is certainly enough to get a main sequence star a nice start. You also made a statement that gave the indication most of the neutrinos passing through the earth originate from the sun. Actually only a small fraction originate from the sun. As for your statement that a neutron star is transparent to neutrinos, we know nothing of the kind. You cannot make direct comparison of the sun and a neutron star because the sun is plasma mostly empty space where as neutron star is more dense than a nucleus. And remember NOT all neutrinos from the sun are transmitted even through the earth. A neutron star is billions of time more dense and should stop billions of the number. That is enough to cause the decay of billions of nuclei neutrons. From the two sources below one can easily come the conclusion that NONE of the neutrinos that strike a neutron star would exit the other side!! There is a background of neutrinos from the BB itself. All the visible galaxies have been adding neutrinos since. Notice these are LOW energy neutrinos, now why would this be the case? Well that's because neutrinos are really a type of neutral radiation and defuse by the inverse square JUST like light. "Like the cosmic microwave background radiation (CMB), the CνB is a relic of the big bang, and while the CMB dates from when the universe was 379,000 years old, the CνB decoupled from matter when the universe was 2 seconds old. It is estimated that today the CνB has a temperature of roughly 1.95 K. Since low-energy neutrinos interact only very weakly with matter, they are notoriously difficult to detect and the CνB might never be observed directly. There is, however, compelling indirect evidence for its existence." Notice also the Wiki article also states the low-energy neutrinos are notoriously difficult to detect. Well, we observed them everywhere, they are the MAJOR source of radioactive decay. The more energetic one we observe from the sun haven't defused much yet and are able to cause decay in some stable nuclei. No we don't agree. I'll repeat what I said before, if you change a neutron to a proton in a carbon-14 atom, you get a nitrogen-4 atom. The reaction will always increase the atomic number by 1. The proton is ~2000 times more massive than the electron and since momentum is conserved, the kinetic energy given to the electron is ~2000 higher (more since the proton is bound). As I said, the reaction would not produce a single hydrogen atom. It may create unstable nuclei but you then have to look at how those decay and no natural decay produces free hydrogen. Not quite. If they are relativistic, they lose energy because they get red-shifted just like photons. Once the energy drops too low, they have a small mass and that remains constant. "It is estimated that today the CνB has a temperature of roughly 1.95 K. Since low-energy neutrinos interact only very weakly with matter, they are notoriously difficult to detect and the CνB might never be observed directly." Exactly. Note that solar neutrinos have an energy around 400keV and the reaction C-14 to N-14 used as an example needed 156keV. Relic neutrinoes have far less energy so cannot trigger decay. That's one reason why they are so hard to detect. I'll repeat what I said before, if you change a neutron to a proton in a carbon-14 atom, you get a nitrogen-4 atom. I just spotted a typo, that should say ".. you get a nitrogen-14 atom.". The atomic number increases but the mass number stays the same. This one type of decay there are many other types including the ejection of a neutron which does decay into a hydrogen atom. "Exactly. Note that solar neutrinos have an energy around 400keV and the reaction C-14 to N-14 used as an example needed 156keV. Relic neutrinos have far less energy so cannot trigger decay. That's one reason why they are so hard to detect." The point you are missing here is it may take much less energy to precipitate a decay than the energy released after the decay. A nucleus is like a loaded spring in all element heavier than iron. It takes less energy to split those nuclei than they release. And for elements lighter than iron they can absorb the background energy until they decay just a free neutron does. This same thing can happen in the nuclei of lighter elements. That sentence is not counting the low energy one's here. It is referring to neutrinos we can directly detect. The total energy may be higher in the MvB. "Not quite. If they are relativistic, they lose energy because they get red-shifted just like photons. Once the energy drops too low, they have a small mass and that remains constant." Wouldn't this violate the conservation of energy and momentum if neutrinos are particles? I believe you are right Natello. Here is a summary Fleet, if one cannot explain what precipitates radioactive decay, neutrons etc., everything that follows most likely is missing important information. It contains an element of speculation in its conclusions. This is especially true with the descriptions of the inner workings and contents of a neutron star. There is NO place for MAGIC in science. ... if one cannot explain what precipitates radioactive decay, neutrons etc., everything that follows most likely is missing important information. It contains an element of speculation in its conclusions. This is especially true with the descriptions of the inner workings and contents of a neutron star. Radioactive decay is just another form of quantum mechanical de-excitation. Neutrons can decay because there is a lower energy 3-quark state-- a proton. The rate (or lifetime) for that excited state is determined by the relative potentials of those two states and their quantum mechanical properties. It's because we DO understand this decay that we can reasonably approximate the state in more extreme cases like neutron star matter. Absolutely! Please don't pretend that your magic (explosions that go into orbit around the source to make planets; significant decay of neutrons in bound states) is science. It is not. It has been long known that metalicity is higher in the inner regions of galaxies than the outer regions, so that observed pattern does not argue against. The article does mischaracterize these collisions as if they were "head-on" collisions of unassociated neutron stars. The sources being examined in this study are NS mergers. Mergers of co-orbiting NSs that decay until the two NSs merge. So the stellar density is not relevant. You have been the unfortunate victim of a poorly worded article and wrong diagram. You still have not fully explained why a particular radioactive element decays. What causes a particular neutron to decay in an element this year as opposed next year or a million years from now. I would love to hear your explanation as to why even the precise half-life of free neutron has NOT been established. According to your explanation, if all neutrons and nuclei are identical, they would all decay at the same instant. Otherwise some magic is involved in determining which decays when, where and why. Who has the magic in science, the inflationary period immediately after the BB, that's one. Here is another one, the acceleration of the expansion of the universe continually decreases the energy and momentum of the photons violating the conservation law. Note that it applies to nuclei to the left of the lower dashed line, for example Be-13. Now look at the example I gave before, absorption of a neutrino would change C-14 into N-14, that's a move of one up and one to the right. Note also that the time it takes for the neutron to be ejected naturally is around 10^-21 seconds, these nuclei don't hang around waiting for a neutrino. The point you are missing here is it may take much less energy to precipitate a decay than the energy released after the decay. Nope, the reactions are entirely symmetrical. Just draw the Feynman diagram and flip the neutrino to be incoming instead of outgoing, it's obvious. That sentence is not counting the low energy one's here. It is referring to neutrinos we can directly detect. The total energy may be higher in the MvB. The total energy is far lower but that doesn't matter, the nucleus can't store energy so the behaviour is like the photoelectric effect, any particle with too little energy cannot participate and just passes on. The question is no different to that for photons. According to your explanation, if all neutrons and nuclei are identical, they would all decay at the same instant. You have it the wrong way round. The fact that decay is characterised by a half-life means it is exponential which in turn means the probability of decay in any period of a given duration is identical to that in any other similar period. That proves there is no accumulation involved. If you were right, all neutrons would decay around a common time after they became free determined by the average rate of neutrino interactions. This statement is just not correct all nuclei heavier than iron release energy store in them the moment they were created in a supernova. And it takes LESS to split them than what the release. This is not accurate either, all neutrons would not decay at the same moment whether free or bound for at least two reason. One, the CvB like the CMB is not uniform and on top of that they are in motion. Two, neutron bound in a nuclei can transfer energy to other adjacent nucleons. Plus many neutrons in a nuclei are somewhat shielded from the CvB. Furthermore probabilities only have one of two sources, internal, external or a combination of both. I say in the case of radioactive decay it is external. You say absolutely not, so must think it is internal. If so what is the difference between what we consider identical particles neutrons, quarks, etc.? If you think these particles are identical the only other source is MAGIC. You are confusing two situations. What I said is that if you want to reverse an interaction then the enrgy is the same. In other words, if some element A decays to element B with the release of energy E, then converting B back to A requires the input of energy E.
This is not accurate either, all neutrons would not decay at the same moment whether free or bound for at least two reason. One, the CvB like the CMB is not uniform ..
That's why I said "around". If there is a threshold reached by a number of increments then the distribution would be Poisson. If the mean number is large, that would be close to a narrow gaussian spread about the mean. and on top of that they are in motion. Two, neutron bound in a nuclei can transfer energy to other adjacent nucleons. That would just increase the number of steps so make the line width narrower, nothing like what is observed. Plus many neutrons in a nuclei are somewhat shielded from the CvB. ROFL, think about what you just said. Furthermore probabilities only have one of two sources, internal, external or a combination of both. I say in the case of radioactive decay it is external. You say absolutely not, so must think it is internal. Einstein famously said "God doesn't play dice with the world." He was wrong, the decay is entirely random as the statistics prove. (I have heard it suggested that it is an interaction with virtual particles in the vacuum but since they appear randomly, the conclusion is the same.) The whole of QM works on such probabilities. I have, it appears you do not truly understand my previous statements, I stand by all of them. I would like to know your answer as to the SOURCE of the probabilities determining which radioactive element will decay next as opposed to the one that will decay a million years from now. You have completely ruled out any external source so the only other source left is internal. What is the difference between a free neutron that decays 5 minutes as opposed to one still around 25 minutes latter? My answer is the 5 minute life one may have been ejected from a nucleus at a higher energy level and, or it is has been unlucky enough to be struck with a higher level of energy from the CvB. By not answering that simple question you are leaving it up to MAGIC. No Einstein was not wrong. Even the number one get from rolling a pair of dice has a source almost entirely external because it they were not pick up or disturbed by some external source they would always display the same number. So closing the door on any external source of radioactive decay for neutrons and unstable nuclei, well they would just always stay the same and never decay UNLESS there is an internal source. So if QM rules that source out also, QM is wrong in this area. Oh, wait a minute, unless you want to inject MAGIC then it could be right. Stand by it all you like, it remains complete rubbish. Let's get rid of the red herrings and just deal with the key point. You have suggested that neutrinos can cause a neutron in a nucleus to change to a proton plus an electron producing hydogen. That is wrong because the proton is not ejected from the nucleus hence, for example, carbon-14 would change to nitrogen-14 but there would be no hydrogen produced. Neutron stars have a crust made of very heavy nuclei as we discussed and white dwarfs have a carbon-oxygen or oxygen-neon-magnesium composition. Again, neutron decay would change oxygen to flourine, neon to sodium and magnesium to aluminium. None of these reactions would produce hydrogen because the proton remains bound in the nucleus. You still have not fully explained why a particular radioactive element decays. What causes a particular neutron to decay in an element this year as opposed next year or a million years from now. I would love to hear your explanation as to why even the precise half-life of free neutron has NOT been established. According to your explanation, if all neutrons and nuclei are identical, they would all decay at the same instant. The decay constant is 1/(880 sec) meaning that in one second each neutron has a 1/880 chance of decaying. If you have 880 M neutrons, 1 M will decay each second. Helium-4 (He-4). He-4 has a mass of 4.001506 atomic units (u). If a neutron transformed into a proton plus electron (beta decay) we'd either get H-4 (mass 4.0278 u) or H-3 (mass 3.0160 u) plus a free neutron (mass 1.008664 u). Since both options are more massive than He-4, beta decay can't happen. If a proton in He-4 transformed into a neutron plus a positron (beta-plus decay) we'd get Li-4 (mass 4.0272 u) or He-3 plus a proton (mass 1.0072965 u). Again both combinations are more massive, so beta-plus decay is energetically forbidden. Finally, what about He-4 splitting into 2 H-2 (deuteron, mass 2.0141 u). Again the daughter products are more massive and it can't decay spontaneously. Of course, if energy is added to the system previously forbidden things can happen. A high-energy gamma ray knocking a neutron free from He-4. But, energy input must be a single photon, not cumulatively from many. What is the difference between a free neutron that decays 5 minutes as opposed to one still around 25 minutes latter? Absolutely none. The decay of all radioactive isotopes is accurately described by an exponential function, it has a well defined half-life. What that means is that the probability of a neutron that has been free for 1 minute will decay in the next second is identical to the probability for a neutron that has been free for a year will decay in the next second. Energy levels are quantised, decay times are not. or it is has been unlucky enough to be struck with a higher level of energy from the CvB. Solar neutrinos have an energy around 400keV, relic neutrinos have energy around 1mev, more than a billion times less and far below the threshold of neutron decay in the nucleus. Oops, that should read: ".. around 1meV, more than a hundred million times .."